Nitroplus Blasterz: Heroines Infinite Duel - PlayStation 4 Review — GamingWithSwag.com - Dads By Day, Gamers By Night. Music/Soundtrack – Contains music faithful to the Nitroplus anime. Story – For a fighting game it is hard to ask for much more. Replay-ability – This all really comes down to the online community that is available. With two different modes available, the potential is there. Value – $39.99 is a sweet spot. A full price $59.99 release would have been asking too much but it includes enough to justify the price. Favorite Element – Localized English subtitles w/Japanese dialogue. 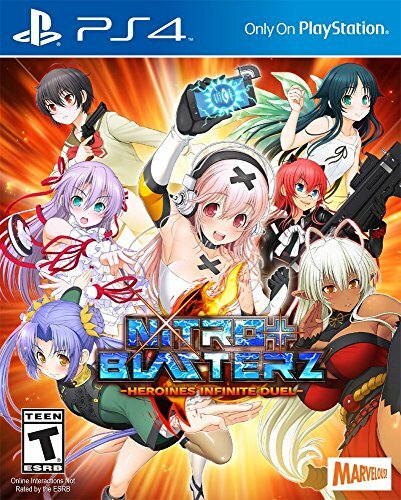 Sean Says – Nitroplus Blasterz: Heroines infinite Dual is a 2D anime fighting game, borrowing mechanics from similar games of the genre – fast paced fighting, brutal combos, and extremely smooth mechanics/gameplay. In addition, all characters come with significantly different skill sets from one another, making a lot of variety between fighters. Localized for Western gamers, Xseed Games does a brilliant job in translating copious amounts of dialogue for fans on this side of the Ocean. In addition, the 2D sprites are welcoming in a world where the majority of fighters releasing have moved to 3D. Fans of Nitroplus or anime in general will feel at home with this one. While likely a non-issue for most, it was interesting to see that a player could earn quite a few trophies from simply button mashing. All in all, the achievement system was a bit of a let-down, allowing one to earn the majority by mashing through the Story Modes. Gareth Says – A well put together fighting game that gives you what you pay for. The $39.99 launch price tag is a sweet spot for this game. There were more than one game last year that I paid $59.99 for only to end up wishing I had paid half or even less. Nitroplus Blasterz: Heroines Infinite Duel is a fun fighter that will keep fans of Japanese style fighting games satisfying. The single player mode that is included comes with the typical small story of each character and a unique ending for each. *SLIGHT SPOILER* (but not really since the trophy list shows it), after beating the standard single player mode you unlock “Another Story”. This is interesting because you can play through and complete matches or you can turn fighting off and just enjoy the story. For a fighting game it is a nice addition to be included. It is relatively quick but interesting. After that you now have two different online modes. The first is the score attack which is really single player but with online rankings. You essentially play through story mode while building your score up through combos and super finishes. This is always a fun way to keep coming back and perfecting your favorite character in order to climb the rankings. The second online mode is the standard matchmaking with online matches. This all really comes down to the amount of people that purchase the game to populate the online community. Since this isn’t a major release of something like a Mortal Kombat, Street Fighter, or Tekken it is hard to judge just how busy the online community will be. The characters all are unique not only in appearance but combat design. They each have their own special finishers which are executed the same but once executed, followed up differently. For example after executing one characters super, you go into a sniper mode and have to aim at the enemy in order for it to connect. I thought this was a fun twist on the usual position and grab of many games. Each character has 18 costumes but they are really just color variations. Still in a world of DLC where pretty much anything is for sale, 18 free color variations needs to be appreciated. Feb 17 Nintendo Account creation now available!